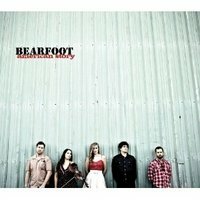 It all began at a music camp in Alaska years ago when the members of Bearfoot met as teenagers. Their love of music and playing together flourished and they began touring and recording. For this new album, American Story, only two of the original members remain, fiddler Angela Oudean and mandolinist Jason Norris, but the signature harmony and ensemble playing remains top notch. The newcomers are Todd Grebe on guitar, also from Alaska, and P.J. George primarily on bass but also adept on banjo, and percussion. Singer/guitarist Nora Jane Struthers now sings most of the leads and brings her songwriting skills to the band as well. Her own group, the Bootleggers, took first place at the Telluride Band Contest in 2010 and the year before that they won a band contest at The Appalachian String Band Gathering in Clifftop, West Virginia. Nora Jane's delivery is strong and pure, even gutsy if the song requires it. Highlight songs include "Tell Me A Story" which speaks to the marvelous and healthy escapism that books and short stories can bring us. In a difficult world, sings Nora Jane, we need this release. "Come Get Some Lonesome" is the song that features the gutsy delivery; Nora Jane's powerful voice is matched by the talents of guest Jeff Taylor (Elvis Costello, Ricky Skaggs) on accordion. The album offers a little tongue in cheek humor in "While You're Away," a song that describes what the housewife is up to while her man is at work. The answer might surprise you. Another message of escape is in the song "Feel Free," describing one of those special places we all have which offers retreat. Bearfoot has come full circle. The group was formed from an experience at a music camp, and now they spend a good time of their year leading workshops in schools across the lower 48 states. The workshops are usually assembly based and are very interactive. Band members continue to be impressed with how fascinated children are with Bluegrass and American Roots music. The group has presented over 60 camps for kids in addition to the in-school performances.